Falcon Lakeside Manufacturing can provide manufacturing design support, working with a customer's engineers to create the best manufacturing process for product performance, manufacturability, productivity, quality, and yield. Using thermal, fluid, and structural computer-aided engineering tools, manufacturing processes can be engineered before any tooling or equipment is in place. Simulations are carried out using EKK Software tools. 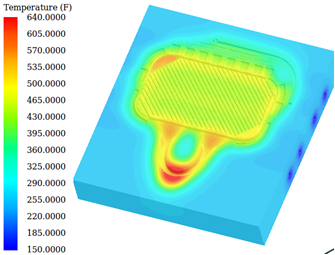 Using these complex analytical tools, our team can develop tooling gating and other thermal management systems.